This should be a nice thing, and in some ways, it is. Most games I play don’t have recognizably latinx characters. They largely sidestep us entirely, taking place in some science fiction or fantasy setting, or offering a vision of the world full of diverse characters that aren’t really from anywhere. And there’s the rub with The Show: sure, it has some flags and last names and a Moments mode designed for celebrating all-time great plays, but it doesn’t celebrate baseball outside of the most anodyne version of the sport. The Show 19 is crisp and welcoming, its opening montage an ode to spring and lovingly manicured baseball diamonds. It’s onboarding is probably the best I’ve seen in a sports game, introducing you to the different ways you can control players and letting you try them in real time. Baseball as presented in The Show is easy to sink into, to break into discrete parts in your mind so you can appreciate the intricacies of each, and understand how to improve them. It’s a clean, readable experience that largely minimizes friction between you and the statistics the sport is fueled by. It’s easy to forget the world around you when you’re doing this. Maybe that’s by design. In the real world, baseball is a sport notoriously avoidant of politics, run by officials who seek to reinforce the idea of baseball as a place without politics, one of the few remaining testaments to the Good Old Days. Sometimes this is reinforced culturally, by the players—like in 2017, when Tamba Bay pitcher Chris Archer was talked out of taking a knee during the National Anthem by his teammates. Other times, the pushback is more institutional, like when first baseman Carlos Delgado made headlines for sitting during “God Bless America” in the middle of the seventh inning stretch. When Delgado was traded to the Mets, owners demanded that he stop his protest, and Delgado complied. Trying to position the sport as apolitical has always been willfully ignorant, but it’s increasingly laughable in recent years when immigrants—the lifeblood of the MLB thanks to the elaborate and grueling system of baseball camps in Latin America and abroad—are under perpetual assault by the United States government. Meanwhile activism by players in other pro leagues—notably the NBA, where commissioner Adam Silver regularly advocates for and supports the free expression of players—is only on the rise, and yet MLB’s preferred stance for both officials and players is, overwhelmingly, silence. I want to love baseball because my dad did. I keep a copy of MLB The Show because of him. Like a lot of dads, he likes baseball, even though his interest is a casual one at this point in his life. He’s also not someone who will pick up a controller for a modern video game—they’re too complicated, and he’d prefer the old arcade games he came up with. But a new release of The Show? He’ll always play a few innings. We don’t have much to talk about these days, and if I’m honest with myself, I’d like to lean on the cultural crutch that sports provide in many male relationships. When I play The Show, I’m reminded that part of the sport’s appeal, for me, is in the downtime, all the space there is to fill with drinks and snacks and conversation. There’s room there to be yourself, as long as you appreciate a warm spring day and the crack of wood against cowhide. I find it harder these days to pretend baseball is played in a vacuum, and celebrating the success of my latinx brothers is only as meaningful as their hardships are clear. I wish baseball did more. I wish the sport that served as such a powerful connection for latinx people everywhere didn’t feel so thoroughly compromised, or willfully blind. 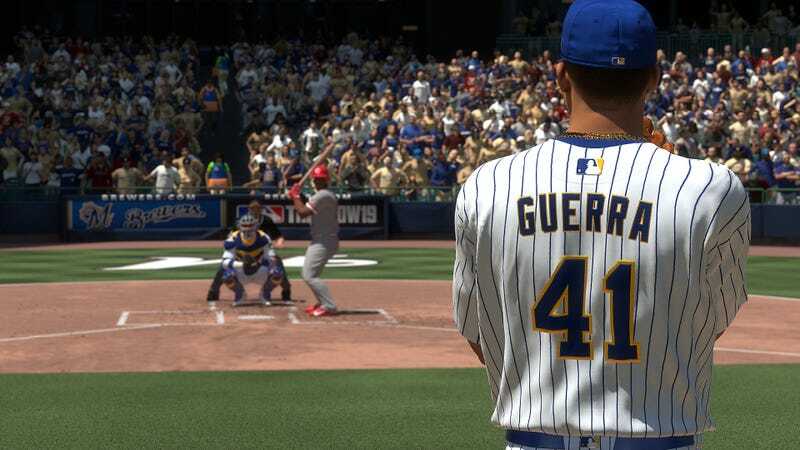 It bothers me to see all that reflected in The Show, simply by virtue of trying to be the best, most accurate baseball simulation on the market—something it’s very good at doing. And because it is faithfully replicating a pro league that seems interested in smoothing over its own latinx edges, the game magnifies the sport’s deficiencies.